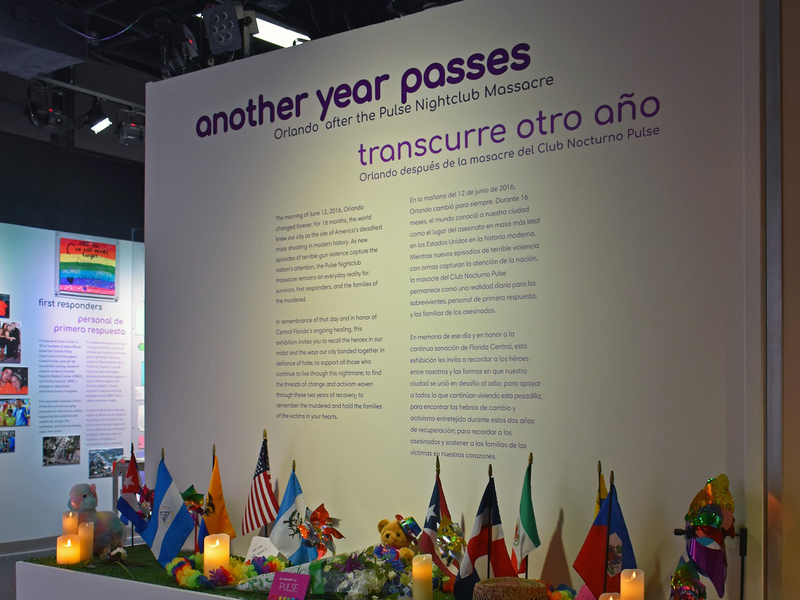 The Orange County Regional History Center will present a new exhibit to mark the two-year commemoration of the mass shooting that took place in Orlando on June 12, 2016. Titled Another Year Passes: Orlando After the Pulse Nightclub Massacre, the special, limited-run exhibition will open on Saturday, June 2, 2018 and will continue through the summer, ending on October 14, 2018. Admission to the History Center will be waived from June 10 to June 16, providing the public with an opportunity to visit the exhibit and History Center at no charge. Operating hours are Monday through Saturday, 10 a.m. to 5 p.m., and Sunday, noon to 5 p.m. The exhibit will include more than 200 images and items collected at Pulse memorial sites throughout Orlando, along with community artwork, international messages and tributes, as well as many individual memento and commemoration items. The iconic 49 tribute crosses created in honor of those who died in the shooting will also be displayed at the History Center from June 10 through June 16. Through the One Orlando Collection Initiative, Orange County’s Regional History Center serves as the guardian and entrusted caretaker of more than 5,000 memorial and tribute items, which were meticulously collected and preserved by curation staff in the wake of the Pulse Nightclub tragedy. The Orange County Regional History Center, housed in the historic 1927 former Orange County Courthouse at 65 E. Central Blvd. in downtown Orlando, features four floors of permanent and limited-run exhibitions. The museum is a Smithsonian Institution affiliate and accredited by the American Alliance of Museums.